Haha! Of course I know it is past mid-April now and I am a little behind time in reporting last month’s garden news! Blame it on the thunderbolt that knocked out our iMac, rendering the computer unserviceable for quite some weeks since late March. And, it was none other than the garden star of March, our luxuriant Platycerium bifurcatum (Staghorn/Elkhorn Fern) that has finally matured into a radiant mama! Wow! A first time mama after almost 3 years of growth. Besides, it had produced four pups altogether! What an amazing feat! We’re extremely delighted and celebrating our grandparenthood! Our tender-loving-care has been rewarded big time! 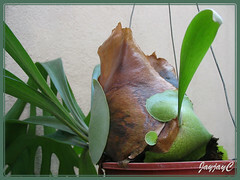 No wonder our Staghorn Fern had been looking so radiant since early March when we first noticed some tiny green things emerging at the lower back end. Hmm…similar to an expectant lady looking so endearing and beautiful, eagerly awaiting her baby’s arrival! 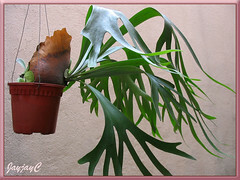 All said, we’re positively sure that our use of banana peels on our Staghorn Fern since early this year had definitely contributed in enhancing its beauty and ability to produce babies. Having read from the internet that banana peels are rich in potassium, which is one of the macronutrients plants need for growth and reproduction, and can be used as fertilizers for plants especially roses and staghorn ferns, we decided to follow through the recommendation. And, the results as seen in the images above affirm it to be true. 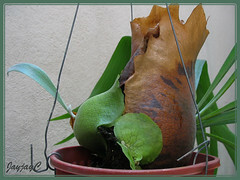 What we did was to soak 2-4 banana peels in a small container of water for a day or two, then pour the blackened water onto the Staghorn Fern through the upper-end opening formed by its overlapping layers of sterile fronds. Sometimes, we may even chop a peel into smaller pieces and scatter them onto the potted soil. We try to repeat this every once in a while whenever we desire to eat bananas, which could be once or twice weekly or fortnightly. 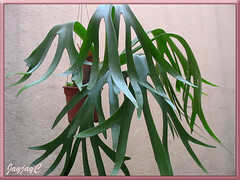 And, the Staghorn Fern just love it, growing happily and gratefully green, lush and productive! Here’s more on how-to use bananas as fertilizers and some info on potassium for plants.